Accessories in PVC bags. Fabric in woven bags. Aluminum in bubble sheet and woven sheet. Small pagodas can create an ideal solution for outdoor events for its flexibility on size and structure. 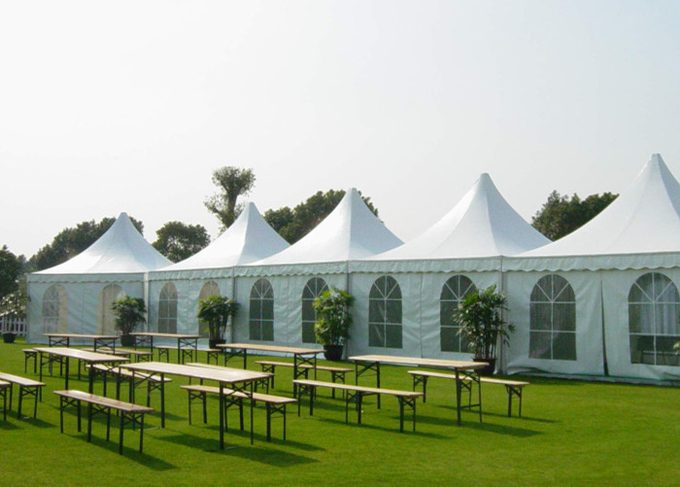 People can use it single or form a big tent to meet different requirements on different shapes of tent but also with elegant appearance. These small 3x3m, 4x4m, 5x5m pagodas are with aluminum structure, white pvc roof and white pvc side walls with transparent windows. It’s with expand screw for concrete ground for fixing. 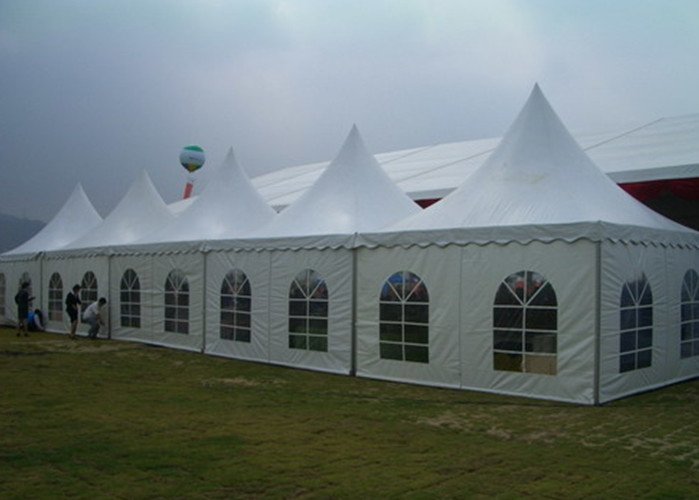 Other tent size are customized. The main frame is hard pressed extruded aluminum profile which can be used over 15 years. The roof cover and side wall cover are high quality double PVC-coated polyester textile, 100% waterproof, flame retardant to DIN4102 B1, M2, CFM, 4-5 level on UV resistant, tear resistant, self-cleaning ability, etc. The connectors is strong hot-dip galvanized steel. The rain gutter is needed to protect from the rain and water when several pagodas are together. For concrete ground, we will provide expand screw for free. For soft ground, such as lawn and sand, we provide steel anchors for fixing. For ground that cannot be destroyed, such as tile floor and wooden flooring, we can provide weight plate for fixing. Rain Gutters: rain gutters between two tents to protect from water or raining. Other Optional Items: AC, chairs, tables, table cloth, lighting, mobile toilet etc. 1. No any pole inside,100% space is used. 2. The tent is put up by screws, easy to be assembled and dismantled, and easy to transport and store. 3. Long life span for heavy duty aluminum structure.